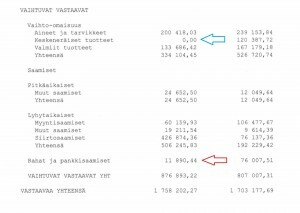 Aktenkundig wurde die Valkee-Story erstmals im September 2006, als der Elektroingenieur Antti Aunio und sein Freund, der Tierphysiologe Juuso Nissilä, in Finnland einen Patentantrag stellten.1 Es ging um ein Gerät mit 2 in die Ohren leuchtenden LEDs, die über Kabel an einem Akku mit Zeitschaltuhr und Dimmer hingen. Die Idee zu der Ohrleuchte entstand laut Nissilä ”über einer Tasse Tee” im Winter 2005/06, der Prototyp des Geräts sei dann innerhalb von Wochen fertig gewesen.2,3 Der Widerspruch zur Firmenwerbung, das Gerät beruhe auf wissenschaftlicher Forschung, sollte Valkee später noch zu schaffen machen. Das finnische Patentamt lehnte den Antrag ab, wie auch weitere Versuche in den Folgejahren.4 Die Idee der Stimmungsbeeinflussung mit Ohrlicht war nicht neu, einige ähnliche Geräte waren bereits zuvor beschrieben.5 Erst 2011, nach mehr als vier Jahren, gelang es Valkee, ein eng begrenztes Patent zu erhalten – für das Ohrlichtgerät in seiner exakten Form (vgl. Geschmacksmuster).6 Die Finnen hatten also nicht die Ohrlichttherapie erfunden, sondern eine bestimmte Ohrleuchte gebaut. Die behördliche Zulassung als medizinisches Gerät war eine Formsache. In Europa zeigten die Skandale um mangelhafte Brustimplantate und defekte Hüftprothesen, wie einfach so ein Zertifikat zu bekommen war.17,18 Valkee erhielt es mit nachgewiesener Produktsicherheit und Produktionsqualität, aber ohne Prüfung auf Wirksamkeit. Das geht aus den Zuständigkeiten der Prüfer und dem Zertifikat hervor, das bis zur Martkeinführung der Valkee-2 Version auf der Firmenwebsite zu finden war.19,20 Die Ohrleuchte war ausreichend ”getestet” – weniger als manche Zahnpasta. Ohne eine einzige wissenschaftliche Publikation zum Thema, ohne dass irgendjemand sonst außer den Firmenmitarbeitern je daran ”geforscht” hätte, wurde Valkees Ohrleuchte im Spätherbst 2010 am Markt eingeführt. Valkee narrowly escaped bankruptcy in 2013. Again. 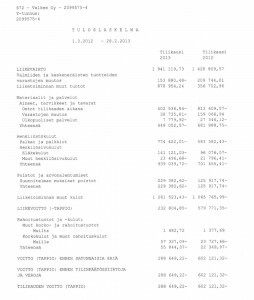 The 2012/2013 fiscal year ended for Valkee with 1.941.120€ sales and a loss of 288.650€, which was remarkably better than 2012. 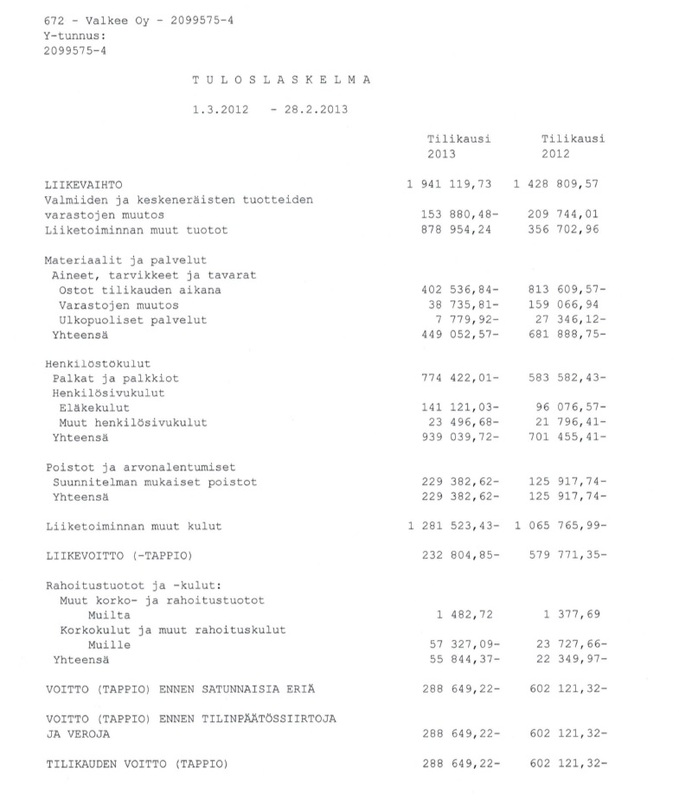 Then it had been a loss of 602.120€, from an overall 1.428.810€ revenue. They cut loss by more than half, and grew from 1,4 m to 1,9 m – moderate numbers for a “profitable startup“, but quite ok. The following pages of the balance tell a different story. State subsidies had risen from 417.000€ to 893.000€, an increase of nearly 477.000€. Without this involuntary cash gift from the taxpayer, the result is – 1.182.100 Euros. In 2012 it was – 1.018.720 – an increased loss when tax money not counted. Production had stopped somewhen up to Feb 2013. Free cash was only 11.890€. Valkee had only left €700 per nose. 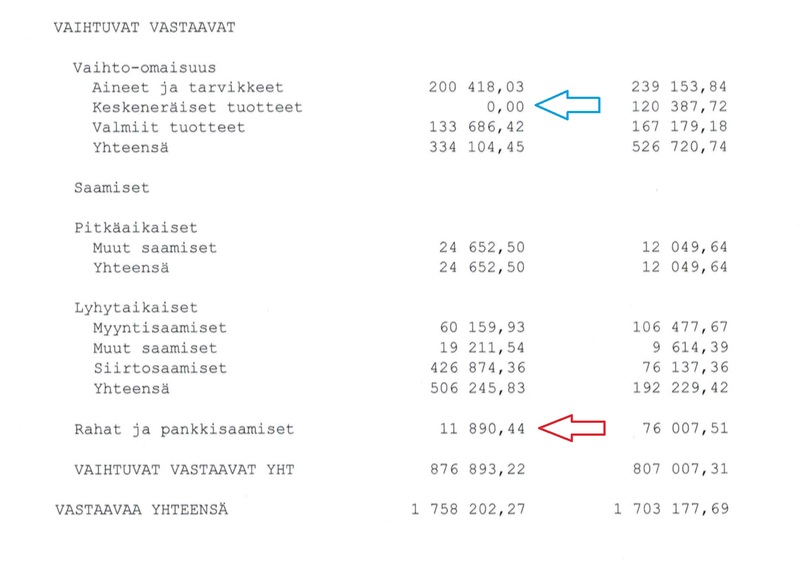 A year before, they survived the bottle neck with another business loan of 300.000€. The local bank took a staggering 18% interest then, a good description of Valkee’s state. It wouldn’t do this again, the small company had already a 550.000€ debt with them. The investors had to rescue the ailing company again. 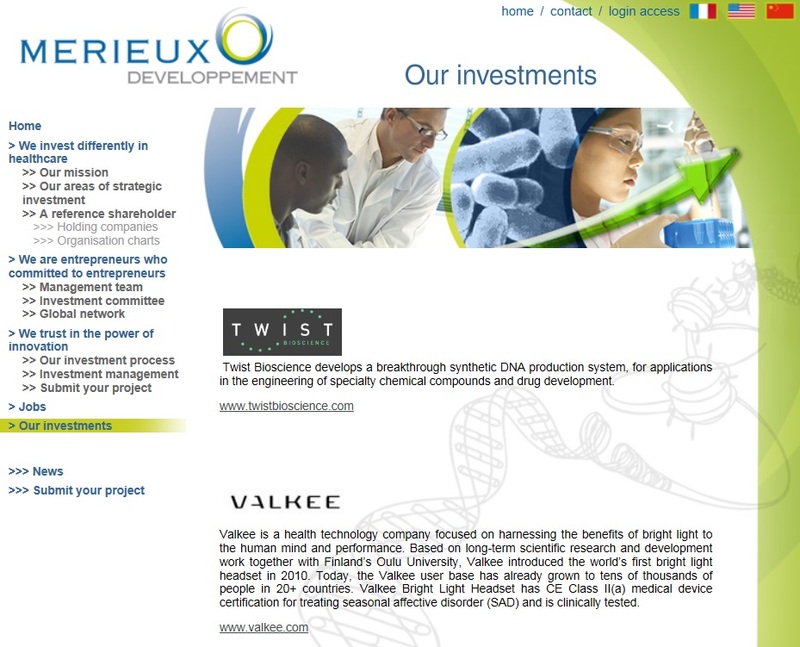 They consequently requested foreign money, from where Valkee’s reputation was not damaged. At the end, more than 7 m Euro were thrown into the company that had already burned multi-million fonds. As turned out later, the major international investor was Merieux Developpement. They seem to have believed Valkee’s tale about scientific research as the venture’s foundation. Merieux Dev. didn’t bother that the University of Oulu “discovered” fitting basics for Valkee’s claims only 5 years after the device was prototyped. The Valkee scandal has become international. A world-class scam from Finland. From September 2010, the english pages of valkee.com, as well as a number of reseller sites, fanfared revolutionary results. 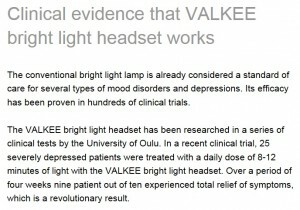 9 of 10 patients were cured from severe depression with a 4-week earlight treatment. 25 individuals participated in the trial. In 2012, things have changed: It’s still 9 of 10, but the trial had 13 patients. What happened to the rest – that’s more than a scholarly question. If you can modify this number just like that, then the result is not reliable. A number of patients was recruited into the pilot study in winter 2008/2009. This is obviously the same trial which was later published in Medical Hypotheses. The dates fit exactly, also the descriptions of the screening procedures and the entry criteria. Abou-Elseoud tells more in an article about the fMRI findings, out of the thesis. There are slight, but clear differences between the wave I (pilot study) patients and the details in Valkee’s publication. Age, HAMD score, number of depressive episodes, all different. But it is the same patient set, with other characteristics identical. The same study has variable numerical values, and most important, a volatile number of participants. 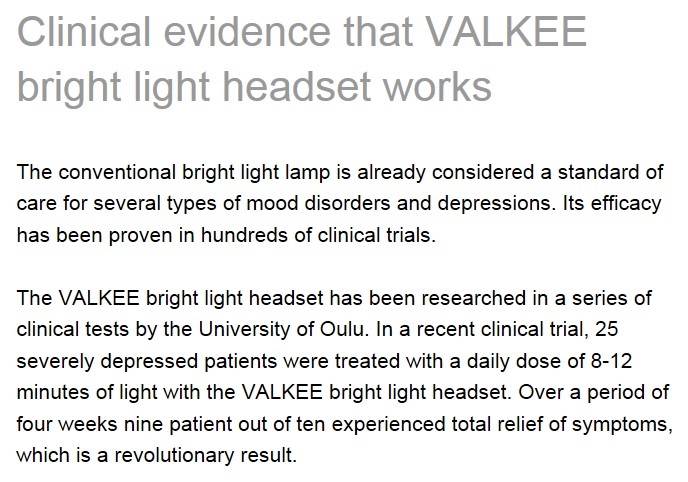 The claim that earlight somehow cured 9 of 10 patients in a trial is absolutely not credible, because even this low-class evidence for Valkee’s effects seems to be fabricated.